A small C12 two-cell church, with few later changes. 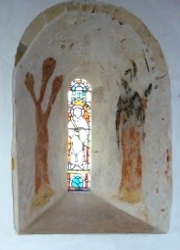 There are remains of C12 wall-paintings and the font is also C12. 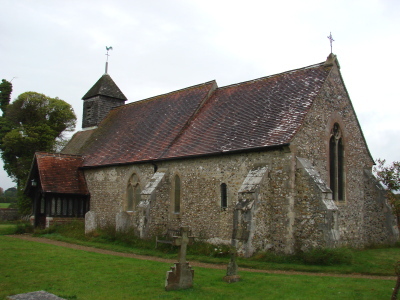 A church in the Hundred of Binsted mentioned in Domesday Book (11, 96) is likely to be the precursor of the present one, for the round-headed windows in the chancel and the blocked one in the north nave of the flint structure look C12. A plain round-headed north doorway in the nave leads into a C19 vestry. There was probably never a chancel arch and the dimensions, including the chancel, look unchanged. Later alterations were confined to windows and doorways. A renewed lancet lowside in the south wall of the chancel, close to the nave, and the plain and pointed south doorway are C13 and the ogee-trefoil-headed west lancet is C14. The shingled bell-turret is of a widespread local type, but rests on C19 posts, so it is probably renewed. Adelaide Tracy (1851) (II p9) shows a large north buttress, partly brick, which blocks a C12 window. She and Quartermain (W p33) show that most windows before 1866 were post-Reformation and so probably was the buttress. There is no present sign of subsidence, but the walls are said to have been dangerously cracked (B 27 p609) and the Sharpe Collection drawing (1805) shows the chancel roof sagging, so the buttress may have been very necessary. 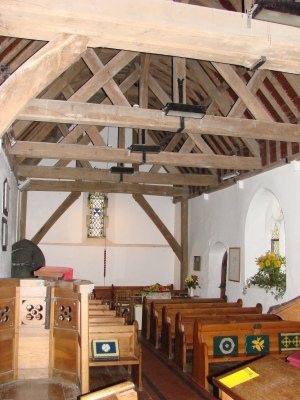 It is too far west to be connected with a rood-stair or its removal. 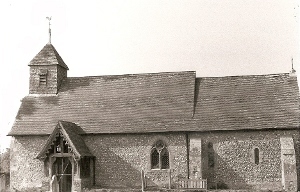 Sir T G Jackson restored the church in 1866-68 (ibid) and replaced the windows – the date is on the east gable. 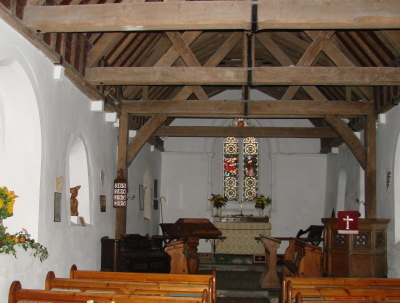 The pretty south porch with fretted bargeboards is also his, as is the small vestry. In replacing the roofs, he claimed to follow the construction of the originals and placed a screen at the join of nave and chancel, which was removed in 1947 (WSRO Par 22/4/3). He presumably also uncovered the sawn-off ends of the roodbeam on each side. Further repairs to the shingling of the pyramid-spire were undertaken by M Gill in 1932 (ICBS – my thanks to Martin Jones for drawing this to my attention). Aumbry: (South Chancel) Triangular-headed and probably C12. Unusually, it is placed over the piscina (see below). Font: Round and recently (www.crsbi.ac.uk retrieved on 1/4/2013) dated to the end of C12. Its bulged out sides are elaborately carved with arcading, capitals and pellets over the arches. Bond singles it out for mention (p47). 1. (East window) J Powell and Sons, 1866 (B ibid). The figures were designed by H Holiday and the patterned background by Jackson himself. 2. 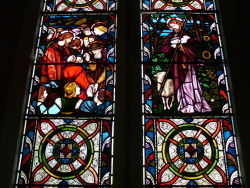 (Chancel north and south windows) Lavers and Barraud, 1868 (www.stainedglassrecords.org retrieved on 4/2/2013). Paintings: Of the C12 paintings uncovered in 1867-68 (1 p234), only those in the splays of the chancel north window survive. They have been linked to the ‘Lewes Group‘, but the style is different, particularly the sinuous plant on the west splay, thought to represent the Tree of Life. Furthermore, the paintings of the Lewes Group are most probably early C12 and as the fabric at Binsted is itself probably C12, a rather later date within that century is likely. On the east splay, a female saint has been identified with St Margaret and more recently with St Mary (VCH 5(1) p125). They are too faded and fragmentary to be certain, though they were of high quality. Piscina: (Under aumbry) Late C12, shaped like a scallop capital of a type associated with Boxgrove (www.crsbi.ac.uk retrieved on 1/4/2013). Tiling: (Chancel floor) By J Powell and Sons, modelled on Cosmati work in Italian C13 style. The tiles in the nave are by Godwin’s (B ibid).